One look at Llumar® glass enhancement film and you will know you have never seen a window film quite like it. • This film lets you achieve the look of etched glass, at a fraction of the cost. • It opens unlimited design possibilities, allowing you to bring vibrant color, visual effects, and graphic patterns to glass surfaces in commercial and residential spaces. • It gives you new power to impart privacy and enhance safety in commercial spaces. Llumar® glass enhancement film puts a new world of creativity, functionality, and flexibility within your grasp. And, within your vision. You can bring color and texture to virtually any glass window, door, or room divider. Subtly or sensationally. Llumar® decorative film puts multiple colors and patterns at your disposal: red, yellow, green, blue, bronze, white, black, matte, frost. Combine any or all to splash on virtually any color. Achieve any hue. Diffuse, focus, or block light completely. You can customize a space with a corporate logo or signage. And, choose from dozens of patterns to create enriching visuals; overlap multiple patterns to create signature effects. Etched glass panels provide a beautiful means of creating an entirely new environment of space, light, and beauty, but they can be costly. LLumar glass treatment films give the appearance of expensive etched glass, come in different patterns and shades, and are easily removed and replaced when a new look is desired. Flexible Design – LLumar allows the customer to bring color, visual effects and graphic patterns to glass surfaces in commercial and residential spaces or customize a space with a corporate logo or signage. Enhanced Privacy – Frosted films allow light to pass through glass while protecting privacy in homes, offices, and commercial environments. 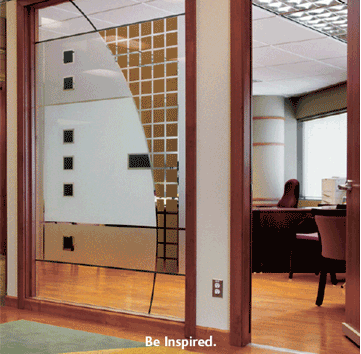 By contract, Llumar® glass enhancement film creates the look of etched glass yet is infinitely changeable. Such flexibility can be especially important in leased spaces or commercial properties where changing company logos and signage mandate frequent updates. Once applied, Llumar® film can be wiped clean with conventional glass cleaner. And, it is far more cost-efficient than etched glass. Llumar® decorative films are custom cut, spliced, and finished to your specifications. Film can be applied to virtually any glass surface, as well as metal, paned, or other flat or cylindrical surfaces. We are centrally located in Anderson SC, So we can travel from Greer SC, Asheville NC to Atlanta Georgia. Achieve the look of fine etched glass without the expense or permanence.